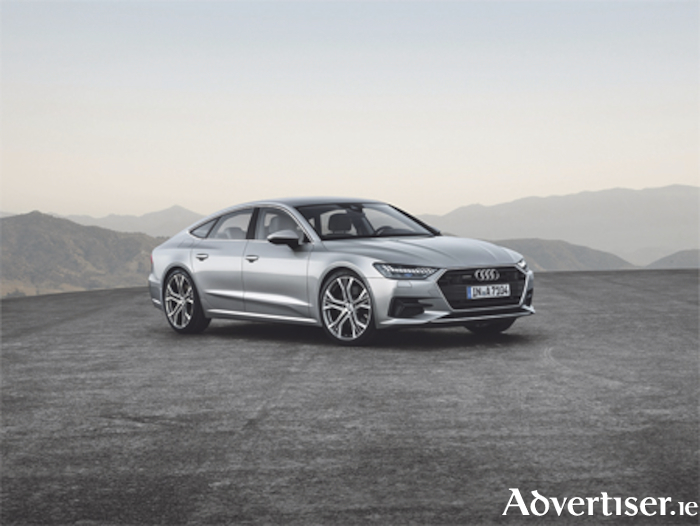 Audi Ireland has revealed the pricing of the all-new and eagerly anticipated Audi A7 Sportback, which starts from €78,150 (OTR ). The new Audi A7 Sportback, available to order now from Michael Moore Audi in Athlone, is a new style of Gran Turismo, offering systematic digitalisation, a contemporary new design and an optimal space concept for a truly unique driving experience. The new model benefits from enhanced standard specification, including Mild Hybrid technology, eight-speed Tiptronic transmission, LED headlamps, Audi Lane Assist and the new haptic touch screen MMI operating system. The main seller in Ireland is expected to be the 3.0 TDI S Line model featuring the new S Line design package, HD Matrix Beam headlights and animated LED rear lights. The exterior design of the new Audi A7 Sportback embodies Audi’s new, progressive design concept, which focuses on large surfaces, sharp edges and alternating light and shadows. The A7 Sportback is an athletic sculpture with a long engine hood, long wheelbase and short overhangs. Pronounced contours emphasize the wheels and reference Audi’s quattro DNA. The wide, low singleframe grille and prominent air inlets represent the dynamic character of the Gran Turismo at first glance. Headlights are available in three versions - LED technology, HD Matrix LED and HD Matrix LED with Audi laser light. The two Matrix variants are divided horizontally to add to the Sportback’s slim and sporty design. The new Audi A7 Sportback’s drive system is now even more efficient thanks to a new mild hybrid system (MHEV ), which will be available with all 3.0 litre TDI engines. The MHEV system is based on a 48-volt primary electrical system and a belt alternator starter (BAS ) generating up to 12 kilowatts of recuperation power. The Audi A7 Sportback can coast with the engine off over a wide speed range and then restart smoothly via the BAS. The start-stop function now activates at 22 km/h. the 3.0 TDI is paired with an eight-speed tiptronic gearbox. The 3.0 TDI produces 286hp and 620Nm of torque, and accelerates from 0 to 100km in 5.7 seconds. The MMI touch response concept with acoustic-haptic feedback offers both a tangible and audible click to confirm activation of a function with a touch of the finger on the interactive display unit. The upper display is used to control the infotainment, while the lower display provides access to the climate control, comfort and convenience functions and text input. Thanks to the logical, flat menu structure, operation is intuitive, similar to that of a smartphone. This cutting-edge automotive technology uses both on board information as well as knowledge from the cloud to process all input. The driver can also control many of the A7’s functions on the steering wheel, as well as an optional head-up display projecting information onto the windscreen.